The contributions of Texas women to the state’s history are as wide-ranging and diverse as the land itself. In examining the Lone Star State’s past from any vantage point, women are an integral part of the timeline. Be they ancient or contemporary, provincial or worldly, as individuals or groups, Texas women make Texas history. TSHA wants to significantly recognize the varied ways women have shaped the state’s history at home, across the state, nationally, and abroad. The Association wants to be sure that our audiences have a technologically updated way to learn about the important contributions women have made to the history of the Lone Star State. Jessica Brannon-Wranosky is the Distinguished Professor of Digital Humanities and History at Texas A&M University-Commerce. She received her Ph.D. in history from the University of North Texas. Her most recent publications include Impeached: The Removal of Texas Governor James E. Ferguson, A Centennial Examination coedited with Bruce A. Glasrud, (Texas A&M University Press, 2017), and essays by her in Texas Women/American Women: Their Lives and Times (University of Georgia Press, 2015)—a 2016 winner of the Liz Carpenter Award, Discovering Texas History (University of Oklahoma Press, 2014), and This Corner of Canaan: Essays on Texas in Honor of Randolph B. Campbell (University of North Texas Press, 2013). From 2009-2014, she was the digital media author for W. W. Norton’s Give Me Liberty, the number one selling U. S. History college textbook worldwide. Dr. Brannon-Wranosky has received several awards for her research including TSHA’s John H. Jenkins Award in 2015 and the Texas Oral History Association’s Best Article Award in 2016. Her forthcoming book focuses on the role Texas and Texans played in the woman suffrage movement at the national and southern regional levels. In order to reach the highest level of quality and success for the project, the Handbook of Texas Women Executive Advisory Committee is composed of preeminent women’s history scholars, authors, and educational, civic, and business leaders—all with a deep interest in supporting the expansion of women’s history content and availability. Each individual on the EAC comes to the project with talent to research, write, consult, plan, organize, network and implement different aspects of project initiatives, and as such, the project overall has the benefit of this vast array of knowledge and expertise to ensure a lasting effect. Her current and past service positions include a Board of Directors member of the Ruthe Winegarten Foundation for Women in Texas History, as Chair of the Membership Committee of the Texas State Historical Association, as a member of the Board of Directors of the Texas Folklore Society, and past President of the St. Edward’s University Alumni Association. She specializes in women’s, Texas, and oral history, and works with the Austin History Center Association’s Austin History Makers project. Her most recent work includes, “Think of the Lives that Might Be Saved: Women’s World War I Work, University of Texas Services and James Ferguson” in Impeached: The Removal of Texas Governor James A. Ferguson (2017) published by Texas A&M University Press. Nancy E. Baker earned her Ph.D. in history from Harvard University. She is an Associate Professor of History at Sam Houston State University. Her research focuses on women’s rights, feminists, and anti-feminists in 20th-century American history. Her most recent publications include “‘No women’s libber’: Texas Feminist Hermine Tobolowsky and the Fight over Equal Rights,” in Texas Women: Their Histories, Their Lives (2015) published by University of Georgia Press and “Focus on the Family: Twentieth-century Conservative Texas Women and the Lone Star Right,” in The Texas Right: The Radical Roots of Lone Star Conservatism (2014) from Texas A&M University Press. Juliana Barr received her Ph.D. in History from the University of Wisconsin-Madison and is currently an Associate Professor of History at Duke University. Her research explores dynamics of Indian-European relations especially as they relate to questions of gender, political economy, diplomacy, and Native sovereignty. She is the author of Peace Came in the Form of a Woman: Indians and Spaniards in the Texas Borderlands (2007), and co-editor of Contested Spaces of Early America (2014) and Why You Can’t Teach U.S. History without American Indians (2015). Daina Ramey Berry is an Associate Professor of History and African and African Diaspora Studies and the Oliver H. Radkey Fellow in American History at the University of Texas at Austin. She is the author and editor of several award-winning books on the history of gender and slavery and has been published in the New York Times, Washington Post, and Slate Magazine among other outlets. Her work has been supported by the National Endowment for the Humanities, the Ford Foundation, the American Council of Learned Societies, and the American Association of University Women. Cathy Bonner has had a successful career as a corporate CEO, entrepreneur businesses in marketing, advertising, communications, cable television, and public relations for almost four decades. Fortune magazine (2001) named Bonner as one of the 25 most influential women entrepreneurs in America. From 1996-2006, Bonner Incorporated launched fourteen state-supported college savings and prepaid college tuition programs, overall for which the campaign raised $30 billion in revenue. As a member of its Board of the Foundation for Women’s Resources, she worked to create the Texas Women’s History Project and was founder and first president of the nation’s first comprehensive Women’s History Museum, which ran at Fair Park in Dallas for over a decade. Her extensive record of public service includes as the 1991-1994 administration of Governor Ann Richards as Executive Director of the Texas Department of Commerce, the founder of three leadership programs: Leadership America, Leadership Texas and Power Pipeline, and as the organizer and driving force behind the creation of the Cancer Prevention and Research Institute of Texas. She is the author of What I Want Next: 30 Minutes to Reveal Your Future published by Sag Harbor Press (2006). Angela Boswell received her Ph.D. in history from Rice University and is currently Professor of History and Dean of Ellis College of Arts and Sciences at Henderson State University in Arkadelphia, Arkansas. She is the author of Her Act and Deed: Women’s Lives in a Rural Southern County, 1837-1873 (2001) and coeditor of Women in Civil War Texas: Diversity and Dissidence in the Trans-Mississippi (2016), both winners of the Liz Carpenter Award from the Texas State Historical Association, coeditor of Women Shaping the South: Creating and Confronting Change (2006), and coeditor of Searching for Their Places: Women in the South Across Four Centuries (2003). Her most recent published book is Women in Texas History(2018). Carroll Scogin-Brincefield is an independent scholar and contributor to a number of publications about Texas, women’s, military, and labor history. She is a retired secondary and post-secondary educator who taught in Missouri, Kansas and Texas, and the former director of the Lavaca Historical Museum, the area where her family has lived for more than a century. She is an active member of a number of location, state, and national historical associations and commissions, serves as President of the South Texas Historical Association and President of the Texas Czech Genealogical Society. Her current projects include research into the participants of the Runaway Scrape. Catherine Clinton is the Denman Endowed Professor of American History at the University of Texas San Antonio. She is the author/editor of over twenty-five books including, The Plantation Mistress, Harriet Tubman: The Road to Freedom, Mrs. Lincoln: A Life, and, most recently, Stepdaughters of History: Southern Women and the American Civil War. She served as President of the Southern Historical Association in 2016 and received a Guggenheim Award for 2016-17. Stephanie Cole is associate professor of history at the University of Texas at Arlington, where she teaches courses in U.S. Women’s History. She has authored and edited numerous books and articles on race and gender, including Beyond Black and White: Race, Ethnicity and Gender in the US South and Southwest (2004), co-edited with Alison M. Parker, and The Folly of Jim Crow: Rethinking the Segregated South (2012), co-edited with Natalie J. Ring. Her co-edited volume, with Elizabeth Hayes Turner and Rebecca Sharpless, Texas Women: Their Histories, Their Lives (2015) won TSHA’s Liz Carpenter Award. Debbie Cottrell serves as Vice President of Academic Affairs at Texas Lutheran University. She holds a bachelor’s degree from Baylor University and a master’s and Ph.D. in History from the University of Texas at Austin. She has also held faculty and administrative positions at Cottey College (Missouri), Smith College (Massachusetts), and William Peace University (North Carolina). Her scholarly interests are in the area of U.S. Women’s History and the history of education, along with a distinct appreciation for regional history, particularly the region of Texas. She is the author of Pioneer Woman Educator: The Progressive Spirit of Annie Webb Blanton. Carolina Castillo Crimm is Founder and CEO of Historic Tours of Texas and Professor Emerita of Sam Houston State University. She received her doctorate in Latin American History from the University of Texas and is the author and editor of numerous books and articles on colonial and ranching Texas and Spanish Texas history. Her book, De León: A Tejano Family History, was awarded Texas Old Missions and Forts Restoration Association book award, the Presidio La Bahía Award, and the San Antonio Conservation Society Foundation 2005 Citation. Light T. Cummins recently retired as the Guy M. Bryan Professor of History at Austin College. A Texas historian, he is the author or editor of fourteen books, including Emily Austin of Texas, 1795–1851 and Allie Victoria Tennant and the Visual Arts in Dallas, both winners of the Liz Carpenter Award, several dozen scholarly articles or book chapters, two college-level history textbooks, numerous popular essays, and a series of newspaper articles. He served as the State Historian of Texas from 2009-2012. Victoria H. Cummins recently retired as the A. M. Pate, Jr. Professor of History at Austin College where she taught Women’s History and Latin American history. She received a Ph.D. from Tulane University. She has researched and published on women and the fine arts during the early Twentieth Century. Recent articles include essays dealing with women and the Public Works of Art Project in Texas and a biographical book chapter dealing with art critic Frances B. Fisk She is currently researching a book-length study of women promoting the arts in pre-World War II Texas. Lynn Denton is the Director of the Public History Program in the Department of History and Associate Professor of History at Texas State University. She received her Ph.D. from the University of Texas at Austin and her research focuses on collectors and collecting, material culture, and representation and the mediation of meaning in museums. She is the founding Director of the Bob Bullock Texas State History Museum in Austin and is an active member of the Philosophical Society of Texas, the National Council on Public History, American Association for State and Local History, American Alliance of Museums and Texas Association of Museums. Maria Angela Diaz is an Assistant Professor of History at Utah State University. She graduated from the University of Florida with her Ph.D. in American History. Her main areas of research include the American South, the Civil War era, borderlands studies, slavery, race, American imperialism and territorial expansion. Her current book project is based on her dissertation and addresses the process of U.S. territorial expansion into the Gulf of Mexico and the U.S. South’s interest in obtaining Latin American territory in the decades before the Civil War. Yvonne Davis Frear is Department Chair of Social Sciences and Liberal Arts and Sciences Liaison to Dual Credit at San Jacinto College Central in Pasadena, Texas, where she is also a History professor. Her written scholarship on African Americans in Texas has appeared regionally, nationally, and internationally in award-winning publications including Southern Black Women in the Modern Civil Rights Movement, Lone Star Pasts: Memory and History in Texas, Major Problems in Texas History, and the German published encyclopedia, Schriftenreihe des Fachberichs Betriebwirtschaft der HTW (translated, Yearbook of the Department of Business Administration). Shennette Garrett-Scott is an Associate Professor of History and African American Studies at the University of Mississippi. She also serves as Publications Director for the Association of Black Women Historians and is a Trustee for the Business History Conference. Her research interests focus on African American women in insurance and banking. Her recent publications include, her book Banking on Freedom: Black Women in U.S. Finance before the New Deal, “‘To Do a Work that Would Be Very Far Reaching’: Minnie Geddings Cox, the Mississippi Life Insurance Company, and the Challenges of Black Women’s Business Leadership in the Early Twentieth-Century United States,” Enterprise and Society (September 2016) and “‘The Hope of the South’: The New Century Cotton Mill of Dallas, Texas, and the Business of Race in the New South, 1902–1907,” Southwestern Historical Quarterly(October 2012), which won the TSHA Carroll Award for Best Article. Gabriela González is associate professor of history at the University of Texas at San Antonio where she teaches courses in the U.S.-Mexico border, the histories of women and Latinas/os in the United States, historical methods. She received her Ph.D. in U.S. history from Stanford University in 2005. She is the author of the recently released, Redeeming La Raza: Transborder Modernity, Race, Respectability, and Rights, and has written articles on transborder activists, among them “Carolina Munguía and Emma Tenayuca: The Politics of Benevolence and Radical Reform, 1930s,” Frontiers: A Journal of Women Studies, A Special Issue on Gender on the Borderlands (Spring 2004). Rachel M. Gunter received her Ph.D. in history from Texas A&M University. She is a Professor of History at Collin College in Plano, Texas, and is the Texas Coordinator for the Online Biographical Dictionary of the Woman Suffrage Movement in the United States. Her research focuses on the Texas woman suffrage movement and its effects on the voting rights of other groups including immigrants, servicemen, WWI veterans, Mexican Americans and African Americans. Her publications include “Without Us, It is Ferguson with a Plurality,’ Woman Suffrage and Anti-Ferguson Politics” in Impeached: The Removal of Texas Governor James E. Ferguson (2017) published by Texas A&M University Press. Sarita Armstrong Hixon serves as a County Commissioner of Kenedy County, proudly following in the footsteps of her mother, Ambassador Anne Armstrong. For over 150 years, her family has owned The Armstrong Ranch—a working ranch in Kenedy County, where she grew up and which she now co-manages. She serves on numerous boards and advisory councils, including the board of trustees of the Texas State History Museum Foundation, the Friends of the Texas Historical Commission, the Houston Hospice, the Texas Historical Commission from 2005 to 2011, as former chair of the San Jacinto Museum of History Association, the San Jacinto Historical Advisory Board and the board of trustees of the Friends of Communities in Schools in Houston. She is also the 2018-2019 President of the Texas State Historical Association. Kay Bailey Hutchison is the only woman ever elected to the U.S. Senate from Texas serving from 1993–2013. She was elected Texas State Treasurer in 1990, serving until 1993. She has written three women’s history books. The first two, American Heroines: The Spirited Women Who Shaped Our Country and Leading Ladies: American Trailblazers, were best sellers charting the women who broke barriers to help build America. Her most recent book, Unflinching Courage: Pioneering Women Who Shaped Texas, was published in 2013. Jacqueline Jones is Professor of History, the Chair of the History Department, the Ellen C. Temple Chair in Women’s History, and Mastin Gentry White Professor of Southern History at the University of Texas at Austin, where teaches American history. Jacqueline Jones is the author of several books in women’s history, including, most recently, Goddess of Anarchy: The Life and Times of Lucy Parsons (2017). Additionally, her books A Dreadful Deceit: The Myth of Race from the Colonial Era to Obama’s America (2013) and Labor of Love, Labor of Sorrow: Black Women, Work and the Family from Slavery to the Present (25th Anniversary Edition, 2010) were finalists for the Pulitzer Prize; Labor of Love won the Bancroft Prize for 1986. Her current project is a study of the African American community in Boston during the Civil War era. Nancy Baker Jones, Ph.D., is founding president of the Ruthe Winegarten Foundation for Texas Women’s History (Austin). She is a general editor of the “Women and Texas History” and “Ellen Temple Classics” book series, both published by Texas A&M University Press, the book review editor for the Southwestern Historical Quarterly, and was the research director for the revision of the New Handbook of Texas, the author of a number of articles and editor and co-editor of a number of books on Texas women including Capitol Women: Texas Female Legislators, 1923-1999 and Women & Texas History: Selected Essays. 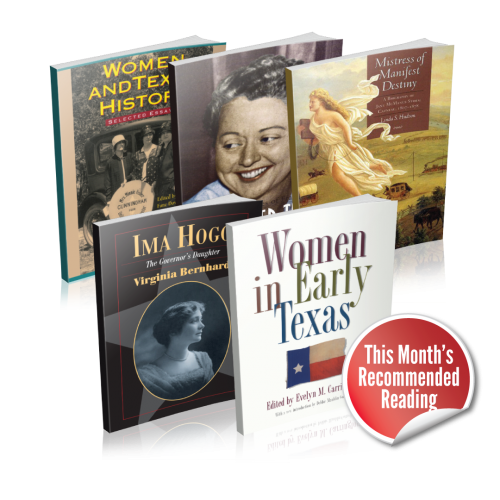 Ruth Hosey Karbach is an independent scholar and contributor to a number of publications about Texas women’s history including Grace and Gumption: Stories of Fort Worth Women and Texas Women/American Women: Their Lives and Times. Her special interests are professional women and women’s organizations in Texas in the nineteenth century and the early-twentieth century. A graduate of the University of Texas at Arlington, she has worked for history museums and archives and as a social worker. Karen Kossie-Chernyshev, Ph.D., serves as Professor of History at Texas Southern University. Her recent edited works include Angie Brown: A Jim Crow Romance (Outskirts Press, 2017), specifically designed to invite public discussion, and Recovering Five Generations Hence: The Life and Writing of Lillian Jones Horace (Texas A&M University Press, 2013), which contains scholarly essays treating various aspects of Horace’s life and work. She is the first African American to earn a Ph.D. in the field of history from Rice University, and the first African American woman to earn a Ph.D. from a Texas institution. Sharon A. Kowalsky is Associate Professor of History, Department of History Chair, and Director of Gender Studies at Texas A&M University-Commerce, where she teaches courses on Modern Europe, women’s history, and gender studies. Her research focuses on women, deviance, and legal norms in Revolutionary Russia. She has published on female crime, infanticide, and the criminological profession in early twentieth-century Russia, and her current work explores the relationship between sexual violence and revolutionary transformation, including her book Deviant Women: Female Crime and Criminology in Revolutionary Russia, 1880-1930. Dr. Katherine Sharp Landdeck is an Associate Professor of History at Texas Woman’s University where she specializes in teaching twentieth-century United States, global war, and public history. Her research focuses on the Women Airforce Service Pilots of World War II, which she has shared in documentary films, public history exhibits, and her forthcoming (Crown Publishing-a division of Random House) book. Yolanda Chavez Leyva received her Ph.D. from the University of Arizona in 1999. Born and raised in the Ciudad Juarez/El Paso area, she serves as an Associate Professor in the Department of History and as Director of the Institute of Oral History and the Borderlands Public History Lab at the University of Texas at El Paso. She is the recent recipient of the Herbert Feis Award from the American Historical Association for “distinguished contributions to public history.” In 2013, she received the “Outstanding Public History Award” from the National Council on Public History as co-founder of Museo Urbano, a museum without walls that highlights the history of the border. She serves on the national boards of the National Council on Public History and the National Collaborative for Women’s History Sites. Deborah L. Liles is the W.K. Gordon Endowed Chair in Texas History in the Department of History at Tarleton State University. She earned her Ph.D. at the University of North Texas. She was the co-editor of Women in Civil War Texas: Diversity and Dissidence in the Trans-Mississippi, which won the 2017 Liz Carpenter Award. Most recently she has co-edited African Americans in Central Texas History: From Slavery to Civil Rights and Texas Women and Ranching: On the Range, at the Rodeo, and in Their Communities. Paula Mitchell Marks, Ph.D., is Professor Emerita of American Studies at St. Edward’s University. She received her doctorate from the University of Texas with concentrations in U.S. Women’s History, history of the American West, and American literature. Her book on nineteenth-century San Antonio residents Samuel and Mary Adams Maverick, Turn Your Eyes Toward Texas, was awarded TSHA’s Kate Broocks Bates Award and the Texas Historical Commission’s T. R. Fehrenbach Award. She is a TSHA Fellow and served as Association President for 2017-2018. Brenda Taylor Matthews is A. M. Pate Chair of History at Texas Wesleyan University. Matthews began teaching courses in Texas History, Women’s studies, Latin America, and 20th Century American history in 1995. In 1998-99, she held a Fulbright Professorship in American Studies at the University of Stuttgart, Germany. She has numerous publications on the New Deal, Texas, and Women’s History including contributions in Grace and Gumption: Stories of Fort Worth Women and Grace and Gumption: The Cookbook. She and her colleague Elizabeth Urban Alexander, assisted by Archivist Louis Sherwood, wrote the text for Texas Wesleyan University’s 125-year history, College on the Hill. Matthews is now focusing her research on the WPA’s Guide to Texas. Judith N. McArthur is the author or coauthor of five books, including Minnie Fisher Cunningham: A Suffragist’s Life in Politics, which won the T.R Fehrenbach and Liz Carpenter awards, and Texas Through Women’s Eyes: The Twentieth-Century Experience. Her research has focused on women’s social reform movements and grassroots political activism. She received her Ph.D. in U.S. history from the University of Texas at Austin and is a TSHA Fellow. Monte L. Monroe received his Ph.D. from Texas Tech University, is the current Texas State Historian, and archivist for the Southwest Collection/Special Collections Library at Texas Tech. As a former editor of the West Texas Historical Review, he has taught and published widely on Texas history. He serves on numerous Texas historical and archival advisory committees and boards and is a founding board member of the Humanities Center at Texas Tech, president of the Rotary Club of Lubbock Foundation, former president of the Downtown Rotary Club of Lubbock and president of The Meriwether Society, Inc.
Laura K. Muñoz is the Assistant Professor of History and Ethnic Studies at the University of Nebraska-Lincoln. Previously, she held the the Joe B. Frantz Associate Professor of American History position at Texas A&M University-Corpus Christi, and is a former National Academy of Education/Spencer Postdoctoral Fellow. She received her Ph.D. from Arizona State University and specializes in the history of race, gender, and education in the Southwest. Cynthia E. Orozco, Professor of History and Humanities at Eastern New Mexico University, Ruidoso, received her BA at UT Austin and Ph.D. from UCLA. A TSHA fellow, she is the author of No Mexicans, Women or Dogs Allowed: The Rise of the Mexican American Civil Rights Movement, co-editor of Mexican Americans in Texas History, and wrote eighty articles for the New Handbook of Texas. Nancy Painter Paup is a fundraising consultant with more than twenty-five years experience in fund development. Formerly, she was Corporate Relations and Membership Manager of the Amon Carter Museum of American Art. Currently, she serves as a member of the Texas State Historical Association Board of Directors, the Campaign Vice-Chair of TSHA’s “A Future For Our Past” fundraising campaign, Board of Trustees for Schreiner University in Kerrville, and the Board of Regents at Texas Woman’s University. She is a former board member of the Texas Woman’s University Foundation. A 2003 graduate of Leadership Texas, she is a member of Jewel Charity, Inc., Junior League of Fort Worth (Sustainer), and Leadership Fort Worth Alumnae Association. Paup completed her Bachelor of Science and Master of Education from Texas Woman’s University and has done post-graduate work at Abilene Christian University. Monica Perales is Associate Professor of history at the University of Houston and is also the Director of the Center for Public History at UH. Her first book, Smeltertown: Making and Remembering a Southwest Border Community received the 2010 Kenneth Jackson Award for Best Book from the Urban History Association. She is currently working on a book manuscript on Mexican women, labor, and food in the US Southwest in the twentieth century. Merline Pitre received her Ph.D. from Temple University and is professor of history and Dean of College of Liberal Arts & Behavioral Sciences at Texas Southern University. Her publications include Through Many Dangers, Toils and Snares: The Black Leadership of Texas, 1868-1900 (rev. 2016), Black Southern Women in the Civil Rights Movement with Bruce Glasrud (2013), In Struggle Against Jim Crow: Lulu B. White and the NAACP, 1900-1957 (rpt. 2010), and Black Women in Texas History with Bruce Glasrud (2008), all from Texas A&M University Press. She served as Project Director and Editor of TSHA’s Handbook of African American Texas and is an award wining author and scholar, including receiving TSHA’s Liz Carpenter Award for Black Southern Women in the Civil Rights Movement and Black Women in Texas History, the Lorraine Williams Leadership Award from the Association of Black Women Historians. Her service includes past president of Southern Conference on African American Studies, advisory committees for blackpast.org and OAH Magazine of History. She was the first African American president of the TSHA and is a TSHA Fellow. Mari L. Nicholson-Preuss, Ph.D., is the Director of the University Honors Program and a senior lecturer in history at the University of Houston-Downtown. She earned her doctorate from the University of Houston with fields in the history of medicine, modern France and Great Britain. She received the Excellence in West Texas History Fellowship in 2010 and is completing her monograph, Medicine for Wide Open Spaces. Her current research focuses on health care and medical practice on the South Plains in the twentieth century. Bernadette Pruitt, a native Detroiter, has been a member of the Department of History at Sam Houston State University since 1996. Her monograph, The Other Great Migration: The Movement of Rural African Americans to Houston, 1900-1941 won the 2014 Ottis Lock Best Book Award. She earned her Ph.D. from the University of Houston. Currently she is working on several projects including Blacks in the urban West, World War II Texas, and an anthology on Black women as historians in Texas. Dianne G. Powell is the president and owner of SellMark, a Communications, Marketing and Development firm in San Antonio. She has over thirty years in development, sales, marketing and management positions in both non-profit and for-profit industries. At Sellmark, she has worked with 40 clients over the past 15 years. She is deeply entrenched in the San Antonio community and has participated in over 40 organizations locally and nationally. Many of her clients today have causes related to Texas History such as San Jacinto Monument, Houston History Association, Washington on the Brazos State Park, Harp and Shamrock Society, etc. Her current volunteer work currently focuses on history. She is Chair of the Phillips Lee Phillips Society, the Map Society of the Library of Congress, past president of TSHA, past president of the Texas Map Society and on boards of the Society for the History of Discoveries, etc. Linda Reed received her Ph.D. from Indiana University and is a associate professor of history at the University of Houston. Throughout her career, she has received several prestigious fellowships including from the University of North Carolina, the University of Michigan, the Ford Foundation, and Princeton University. Her books, Simple Decency and Common Sense: The Southern Conference Movement, 1938-1963 (1994) published by Indiana University Press and “We Specialize in the Wholly Impossible”: A Reader in Black Women’s History, (1995) co-edited with Darlene Clark Hine and Wilma King and published by NYU Press—both award winning publications. Additionally, she served nine years as the director of the University of Houston’s African American Studies Program and recently served as the History Department’s Director of Graduate Studies from 2012-2014 and as National Director for the Association of Black Women Historians from 2001-2003. Mary Beth Rogers, was the executive director of the Texas Women’s History Project, which produced the first museum exhibition about the history of Texas women. After serving as Chief of Staff for Governor Ann Richards, she taught at the LBJ School of Public Affairs at the University of Texas in Austin, where she held the Lloyd M. Bentsen Chair in Business and Public Policy. She is the author of Barbara Jordan, An American Hero, as well as other books and articles. Later, she served as the President and CEO of KLRU-TV, the PBS affiliate in Austin. She now lives in Dallas. Mary L. Scheer is a Professor and Chair of the Lamar University History Department and Director of the Center for History and Culture of Southeast Texas and the Upper Gulf Coast. She was a Fulbright Scholar in 2004 to the University of Potsdam in Germany. Dr. Scheer has written or edited five books, including Women and the Texas Revolution, which won the Liz Carpenter Award for the best book in Texas women’s history in 2014, and most recently published Eavesdropping on Texas History (2017). Rebecca Sharpless Professor of History and Director of Graduate Studies at Texas Christian University, where she teaches Texas history as well as Women’s history. She holds a Ph.D. from Emory University. Her publications include Fertile Ground, Narrow Choices: Women on Texas Cotton Farms, 1900-1940, which won the Tullis and Carpenter awards from TSHA, and she was a coeditor (with Elizabeth Hayes Turner and Stephanie Cole) of Texas Women: Their Histories, Their Lives, which won the Carpenter Award in 2016. Louise Single, Ph.D., CPA is a Professor and Accounting Programs Chair at St. Edward’s University in Austin, Texas, where she teaches financial accounting and taxation at the undergraduate and graduate levels. Louise’s research focus for over a decade has been on issues related to women’s advancement in accounting. Her research has been recognized with grants and awards, including Best Paper Awards from the American Accounting Association’s Gender Issues and Diversity Sections. Harold L. Smith is the author or coauthor of six books, including Minnie Fisher Cunningham: A Suffragist’s Life in Politics (2003), which won the T. R. Fehrenbach and Liz Carpenter awards, and Texas Through Women’s Eyes: The Twentieth-Century Experience (2010) which also won the Carpenter award. He received TSHA’s Carroll Award for “All Good Things Start with the Women: The Origins of the Texas Birth Control Movement, 1933-1945,” Southwestern Historical Quarterly (2011). He is a Fellow of the Royal Historical Society of Great Britain, and was Professor of History at the University of Houston-Victoria until his retirement in 2013. Elizabeth Snapp earned her B.A., M.L.S. in Library Science and M.A. in History from the University of North Texas. She graduated from Leadership Texas, Class of 1984, Texas Foundation for Women’s Resources. She is Director of Libraries Emeritus from TWU (2002) and after retirement she taught as an adjunct professor a senior-level course at TWU (2002-1016) on Women in Texas History. She is co-author of the bibliography Read All About Her! Texas Women’s History (1995) and has a new edition in progress. Her research now is focused on continuing to find and publish the bibliographic records for archival and published materials on Texas women and the organizations and the causes for which they worked. Elissa Stroman received her Ph.D. in Fine Arts, musicology emphasis, from Texas Tech University. Since 2010, she has overseen the oral history and audio/visual holdings of the Southwest Collection/Special Collections Library at Texas Tech. Her research primarily focuses on women’s music clubs and the Gilded Age print reception of musical performances of femininity. She is the Associate Editor of the West Texas Historical Review. Jean Stuntz teaches Texas history and Women’s history at West Texas A&M University. She has published one book, Hers, His, and Theirs: Community Property Law in Spain and Early Texas, four book chapters, and several articles on Texas women as well as giving multiple conference presentations on the topic. She received her Ph.D. from the University of North Texas and is the 2018-2019 president of the West Texas Historical Association and past president of H-Net: Humanities and Social Sciences Online. Ellen Clarke Temple is an independent scholar, publisher, and conservationist with a 45 year interest in Texas Women’s history. In the late 1970s, she worked with Ann Richards and the Foundation for Women’s Resources to create the Texas Women’s History Project. She has served on numerous boards and advisory councils, including the board of Humanities Texas from 1984 to 1989, in 2004, and as board chair in 1988, as a member of the University of Texas System Board of Regents from 1991 to 1997, and as chair of the Lady Bird Johnson Wildflower Center from 1997 to 1999. She established the Liz Carpenter Award for Research in the History of Women at the Texas State Historical Association, and the Ellen Clarke Temple Award for the Study of Women in History at the Center for Women’s & Gender Studies at the University of Texas at Austin. Elizabeth Hayes Turner is Distinguished Teaching Professor Emeritus, and Professor of History at the University of North Texas. She is the author of Women and Gender in the New South, 1865-1945; Women, Culture, and Community: Religion and Reform in Galveston, 1880-1920—winner of the Coral Horton Tullis Memorial Prize for Best Book on Texas History; and co-author of Galveston and the 1900 Storm: Catastrophe and Catalyst. She has authored twelve book chapters and articles and is co-editor of nine anthologies, including Texas Women: Their Histories, Their Lives—winner of the Liz Carpenter Prize. She has served as a Clements Center Fellow, a Fulbright Lecturer to the University of Genoa, and is a Fellow of the Texas State Historical Association. Cecilia Gutierrez Venable is the Historian and Director of Archives for the Sisters of the Holy Spirit and serves as State Historian for the Texas NAACP. She has taught history and worked as an archivist at numerous university and public libraries. She has also established several private archives and is currently working on a digital archives data base for the Sisters of the Holy Spirit and an archives project with the Texas NAACP. She has published several books and articles and also writes for the website blackpast.org. She most recently co-edited, Texas Women and Ranching: On the Range, at the Rodeo, and in Their Communities. Frances B. Vick is the retired director and co-founder of the University of North Texas Press and before that president of E-Heart Press. She holds B.A. and M.A. degrees in English from The University of Texas at Austin and Stephen F. Austin State University, respectively, and a Doctor of Humane Letters (honoris causa) from the University of North Texas. Her published works include One Hundred Years of “The Eyes of Texas”, co-authored Petra’s Legacy: The South Texas Ranching Empire of Petra Vela and Mifflin Kenedy, winner of TSHA’s Tullis Award, and as editor of Literary Dallas; co-authored Letters to Alice: Birth of the Kleberg–King Ranch Dynasty. She has been president of the Texas Institute of Letters, the Texas State Historical Association, The Philosophical Society of Texas and is a Fellow of the TFS and the TSHA. She has received the Pro Bene Meritis Liberal Arts Award from UT and The Humanities Texas Award. She currently serves on the College of Liberal Arts Advisory Board at UT, the Texas A&M University Press Advisory Board, and the board of the Clements Center for Southwest Studies at Southern Methodist University. Katherine Kuehler Walters received her Ph.D. in History from Texas A&M University in College Station. She researches race and gender history between the 1880s and the 1930s, and specializes in civil rights activism, structural racism, and voting rights, and has taught history courses at various universities in Texas. Her past publications include co-authoring a piece with Kyle G. Wilkison in Impeached: The Removal of Texas Governor James E. Ferguson, A Centennial Examination. Heather Green Wooten received her Ph.D. in Medical Humanities from the University of Texas Medical Branch at Galveston and currently teaches history of medicine at the Institute for the Medical Humanities. She is the author of numerous publications concerning United States, Texas and medical history including a book chronicling the polio years in Texas including her book The Polio Years in Texas: Battling a Terrifying Unknown (2009) published by Texas A&M University Press, and which received the Texas Historical Commission’s T. R. Fehrenbach Book Award, Old Red: Pioneering Medical Education in Texas (2012) for the TSHA Fred Rider Cotten Popular History Series, and co-authored with William H. Kellar, Skilled Hands: Surgery at the University of Texas Medical School at Houston (2016). She is active in many state and local historical organizations, having held positions in the Texas State Historical Association, and the Galveston County Historical Commission, as is the past president of the East Texas Historical Association.